In the ensuing decades, the phenomenon known as “praise and worship music” or “contemporary worship music” has seen its share of developments. By no means a monolithic movement, it has nevertheless coalesced into a highly recognizable sound and ethos, as demonstrated by the numerous parodies that poke fun at its most predictable features. The dust has settled after the so-called “worship wars” of the 1980s and ’90s, and it appears that contemporary worship has emerged victorious in many spheres of evangelical life. 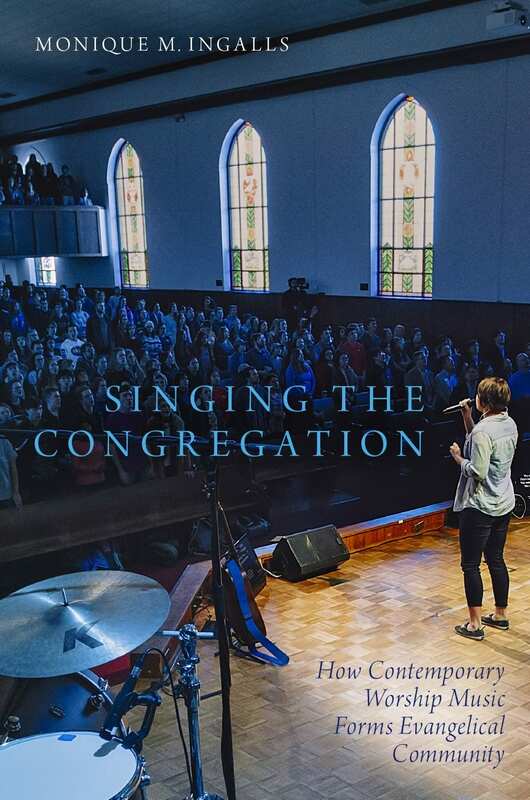 Monique Ingalls, assistant professor of music at Baylor University, tackles this question in her book, Singing the Congregation: How Contemporary Worship Music Forms Evangelical Community. Focusing on the decade from 2007 to 2017, she examines modern praise through sociological lenses. Ingalls analyzes five gatherings in which this type of singing plays a prominent role: worship concerts (ch. 1), student conferences (ch. 2), one local congregation in Nashville, Tennessee (ch. 3), public praise parades (ch. 4), and the virtual “community” of online “worship-video” creators and consumers (ch. 5). Though these social gatherings differ from one another in many respects, one thing unites them: the centrality of contemporary worship music. “For evangelicals, the use of contemporary worship music immediately marks an activity as ‘worship’” (22). Therefore, Ingalls reasons, the act of engaging in modern worship singing produces a sort of “congregation” out of gatherings not traditionally thought of as such. This has deep, often unnoticed, effects on how Christians understand worship and the church. The main value of Singing the Congregation is its thorough description of the world that contemporary worship music has created. Ingalls’s book is a work of musicology. Each chapter is full of anthropologist-style “field notes” and insights culled from interviews with worshipers and music ministers alike. As such, the main value of Singing the Congregation is its thorough description of the world that contemporary worship music has created. For that reason, even if musicology is a new field for you, I recommend this book to pastors, worship leaders, and anyone else with an interest in the modern worship movement—fans and critics alike. To be sure, readers will need to look elsewhere for sustained analysis of the lyrical themes found in modern praise songs. Ingalls’s focus is on worship music as sociological phenomenon, so there is little here in the way of theological interaction with worship lyrics. Still, Ingalls’s in-depth account of how contemporary worship shapes evangelical life proves the axiom that “the medium is the message.” In other words, contemporary worship music not only reflects evangelical values and convictions about how to engage with God, it also profoundly influences those values and convictions. For me, as a church elder, song leader, and hymn writer who “grew up” musically in a variety of modern worship settings, Ingalls’s book provoked me to reflect on the unintended consequences of contemporary worship music. Rather than proceed with a traditional book review, it may be more useful to my readers to share some ways in which Ingalls’s work has prompted my own thinking. So here are four areas of reflection, which I invite you to consider with me. Oxford University Press (2018). 253 pp. $33.99. First, I’ve reflected on how the notion of experience has become a crucial expectation in contemporary worship. Ingalls reports that the language of “worship experience” is pervasive, not only in worshipers’ own descriptions of what they are seeking when singing modern songs, but also in marketing materials for worship concerts and events (22). These worshipers have come to expect “a personal encounter with God during congregational singing,” described as God “‘speaking into,’ ‘ministering,’ or ‘being real to me’” (85). It‘s worth noticing that these folks describe worship more as an experience of receiving blessing from God, rather than responding to God’s majesty with praise. Does that shift toward self reveal that our worship may sometimes not be as God-centered as we hope it is? In a similar vein, some Christians use the language of “worship fix” or “worship junkie” to describe their craving for contemporary worship music. Ingalls suggests what may be behind this: “The language of addiction [seen in such terms] evidences the overwhelming success of the major worship brands in not just responding to felt needs, but also actively producing desire” (204). The question is: desire for what? My aim as a song leader is to foster desire for God and for his glory. My fear, however, is that in the contemporary worship movement we have too often trained people to seek a caffeine jolt of emotional bliss. My fear is that in the contemporary worship movement we have too often trained people to seek a caffeine jolt of emotional bliss. This is where Ingalls’s book can prompt us to some healthy soul-searching about the future of contemporary worship music. What if composers of modern praise songs carefully selected lyrics that focus more on God’s character than on our experience? What if we embarked on a campaign to teach believers that worship is more about ascribing worth to God than pursuing an emotional response—that in fact, our emotions will often be stirred in the right ways when we focus more on God and less on ourselves? Second, Ingalls caused me to consider how contemporary worship music in parachurch settings shapes evangelical expectations for worship through song at church. Many of Ingalls’s interview subjects reported that they found the music at worship concerts and youth conferences more engaging than the weekly singing at their own home congregations. Due to the professional production quality and an environment more conducive to bodily interaction, one young woman concluded that the singing she heard at a concert promoted more authentic self-expression than the singing at her church (53). Others viewed the worship at a conference as “more sacred than church” because of the excitement of worshiping with thousands of anonymous fellow “pilgrims” who have all gathered for a special purpose (102). I’m not against singing at concerts or conferences per se, but it’s worth pausing to consider Ingalls’s point: “Understanding their worship concert activities as worship shapes what evangelicals expect of a ‘worship experience’ in other settings”—especially at church (42). For example, one typical feature of a worship concert is “the amplified wall of sound that facilitates, even as it covers over, the gathered crowd’s signing” (58). Though I love a loud concert as much as the next millennial, and the Bible certainly has some positive things to say about high volume (see Ps. 150:6—though I’d imagine that the decibel levels we can achieve today aren’t quite what the psalmist had in mind! ), this aspect of the worship concert is subtly teaching folks what worship through song means. A wall of sound communicates a set of values. It suggests that passion, intensity, and a sense of losing oneself in a massive sonic ocean are supreme virtues in corporate worship, rather than being able to hear the voices of those around you. If our musical experiences in parachurch settings result in lower esteem for the holy privilege of singing with the assembly that Jesus founded, then perhaps something is amiss. There is an irony here. One of the original goals for the contemporary singing style was to awaken more passionate singing at church, to bring fresh participation out of cold formality. But Ingalls’s interviews made me wonder if contemporary worship music—at least as many evangelicals experience it in concert and conference settings—has become so professionalized and emotionally charged that singing with one’s local church simply seems lackluster in comparison. Stage lights, fog machines, and wall-of-sound arrangements aren’t forbidden in Scripture, but when worship concerts including these components inform what evangelicals understand as “authentic” worship, then we must ask what results when such concert conventions become expected in church services as well. It’s first and foremost the church where the word of Christ dwells in us richly as we sing (Col. 3:16). The church—embodied in visible, local congregations—is the only institution that Jesus has promised will endure to the end (Matt. 16:18). If the musical intensity of a concert is our benchmark for optimal worship, then singing at a church service filled with noisy kids, elderly folks, and people from different cultural backgrounds will let us down. But it seems to be the biblical standard. And if our musical experiences in parachurch settings result in lower esteem for the holy privilege of singing with the assembly that Jesus founded, then perhaps something is amiss. Third, a similar question arises from Ingalls’s research about the prevalence of YouTube “worship videos” being used in churches. Some small congregations have turned to online music videos produced by major worship media companies to accompany their singing. This “phenomenon was not created simply by a lack of musical or personnel resources; it was also a growing sense within these small churches that they could not measure up to the new musical standard” (197). Somehow, though I trust it’s been unintentional, the contemporary worship movement has conveyed that a certain level of production quality is necessary to achieve faithful modern worship. In this sense, contemporary worship has come quite a long way from the folk guitars and simple choruses of the 1970s, which were designed to democratize congregational singing so that more people could engage with it meaningfully. In the 2000s, contemporary worship media have embraced the values of polished production and mass-market appeal. But as modern praise has become more professionalized, it’s led at least some church leaders to conclude that they’d be better off foregoing human musicians altogether and leaving accompaniment to the (virtual) experts. The good news is that God gives each congregation all they need to serve him. First Corinthians 12:18 reminds us that “God arranged the members in the body, each one of them, as he chose.” If that means a church is unable to produce the same quality of music they see at worship concerts and on YouTube, then we can trust God’s good purposes. He cares far more about the state of our hearts than the ability of our band to recreate the sound of an online video. A fourth area for reflection involves how contemporary worship has become a visual phenomenon, not just an aural one. According to Ingalls, digital projection of lyrics and background images has become “pervasive” in churches with a contemporary style (174). She argues, “The worship experience has become irreducibly audiovisual, combining . . . musical devotional practices that accompany contemporary worship and the visual piety surrounding the image” (179). Many Protestants have long been hesitant to incorporate visual elements in corporate worship, stemming from a common view that the second commandment prohibits not just idol worship but any visual representation of God. For some, this has implied that even so-called visual aids—apart from the God-given symbols of baptism and the Lord’s Supper—are potentially distracting to our wandering hearts. It is fascinating, then, to hear Ingalls comment on “how essential the visual dimension has become within the evangelical worship experience,” even cataloging which sorts of images function as “evangelical ‘icons’ during worship” (179). Though she doesn’t give hard numbers, her research would suggest that many churches don’t merely project the words for congregational songs, but also use extensive background images and videos. Nature shots and pictures of anonymous worshipers are especially common. The forms of worship we adopt aren’t neutral. They will mold the next generation of worshipers. Time doesn’t permit a full interaction with the theological issues raised by the question of visual backgrounds in projection slides. I merely mention it here because it shows, again, how the medium shapes the message. Even if images were originally introduced “merely” to provide a pleasing backdrop for the words, many people now engage with worship as “a site of audiovisual convergence” (178). That is certainly a curious state of affairs for a theological tradition with roots in prioritizing the ear (hearing the Word read, sung, prayed, and preached) over the eye. For example, Ingalls tells of one congregant who believed God was giving her a special message through the swirling orbs of light on the screen, which corresponded with similar colors she had pictured while her eyes were closed (190–91). While such an example is admittedly extreme and indicative of other theological problems beyond the mere use of imagery, it does show that the forms we use in congregational worship will shape people’s understanding of how they should engage with God. Contemporary worship music is here to stay, at least for the foreseeable future. I’m thankful for its strengths. It has provided a vehicle for countless millions to honor God through their musical vernacular. A book like Ingalls’s, however, summons us to be semper reformanda—always reforming. I pray that studies like hers will help those of us involved in the contemporary worship movement to understand more clearly the ways our corporate worship shapes people as disciples—for better or worse. The forms of worship we adopt aren’t neutral; they will mold the next generation of worshipers. Let’s never get complacent about where corporate worship is today, but ask God for the wisdom we need to serve him more faithfully in the future. Matt Merker serves as an elder and pastoral assistant at Capitol Hill Baptist Church in Washington, D.C. He writes congregational hymns, including “He Will Hold Me Fast.” He lives on Capitol Hill with his wife and their two children. You can follow him on Twitter.